Archbishop John J. Mitty of San Francisco established St. Perpetua Parish in 1952. Fr. Thomas Collins, the first pastor, celebrated Mass at the local mortuary until the congregation grew necessitating a move to the Park Theatre. Religious education classes were held at the old Town Hall, which is not the Town Hall Theatre. The present church and hall were opened in 1953. In 1961 the rectory and school were built. The rectory is now used for parish office space. St. Perpetua School opened in 1963 with students enrolled in grades one through five. Grades six, seven and eight were added during the following three years. The school was staffed by the Sisters of St. Joseph of Carondelet. Gradually lay teachers were hired and, today, St. Perpetua School is staffed by a lay principal and lay teachers. 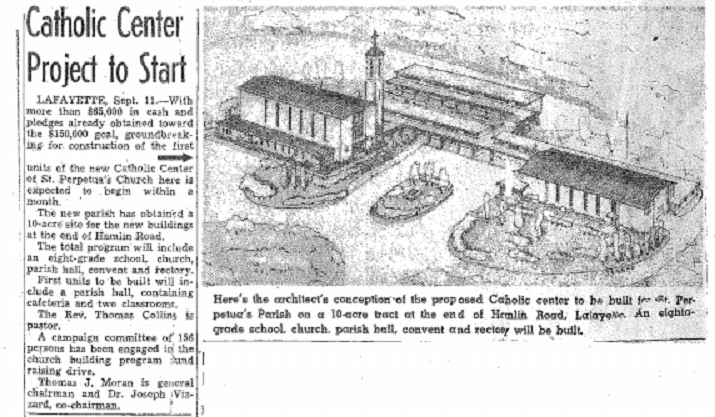 The convent was constructed in 1963-64; the first building in the newly established Diocese of Oakland. The convent is now used as the pastor&apos;s residence. There is also meeting room space and daily Mass is celebrated in the convent chapel. In 1966 a religious education room was built which was used as the school library until the expansion and renovation of the school building. A kindergarten and multi-purpose room was added. In 1956 Fr. Collins was transferred and Fr. John Quinn was appointed pastor. He served until 1970 when he resigned but continued to be in residence at St. Perpetua until his death in 1973. Fr. Arthur Ribeiro was pastor from 1970 to 1980. Pastors following Fr. Ribeiro were Fathers Brian Timoney, John Kennedy, Tim Johnson and John Gilmore. Fr. John Kasper, OSFS, is our current pastor.